-->> .. kind of wondered ..
why Playmates never really introduced the Utrom and Triceraton blasters as toys. There's a number of TMNT inspired squirt guns and what have you with Turtle themes .. but nothing sci-fi and cool like this !! I'm not sure tOkKa, but I assume that the reason Playmates didn't come out with anything Utrom or Triceraton influenced is because the Playmates toys focused more on the Lionsgate cartoon series and not so much on the Mirage universe. The Utroms and Triceratons were not as well known to consumers, and they probably would have looked at the toys and wondered what they were supposed to be. Just my thought, but I may be wrong. -->> Kinda looking at the TMNT toys as a whole. 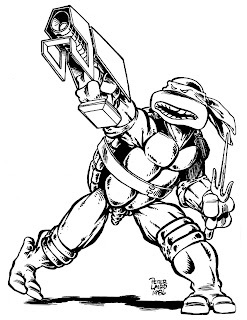 Most of the blasters and weapons, even pre TMNT 4 movie have all been ' Turtles ' design and in scope any most ways. ( Few exceptions.. i recall the Sword of Tengu and the Tokka Battle fun Set ). ..well maybe if they showed the Turtle using the gun on the package ..i wonder if that would have helped. .. i mean face it, the Utrom and Ton' blasters look really really cool !! !! Damm i'd have loved a Tricaraton / TMNT Lazer Tag set or an Utrom Squirt rifle ~!! Hi Peter, i've been meaning to ask if you have any pictures you may have taken from the set of the ninja turtles live action movies? It would be really awesome to see any if you had or took some during your visit to the set. IM a HUGE fan of the live action movies. Thanks! -Mauro"
Thanks Peter, it would really make my day here in Snowy New Jersey if you ever dug up that footage. I miss the live action turtles lol :-). Have a nice day!